When I started seeing pecky cypress in some of my favorite houses, I didn't know much about it, just that I liked it. After some research on the Internet and talking to a few architects, I have become even more intrigued by it. 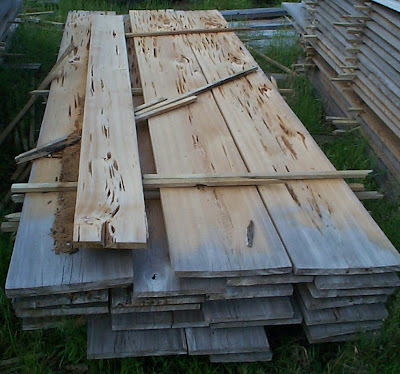 Pecky cypress is one of those amazing products of nature that has enduring appeal. Pecky cypress gets its name from the porous hollowing of Bald Cypress trees by a wood-decaying fungus - Stereum taxodi. 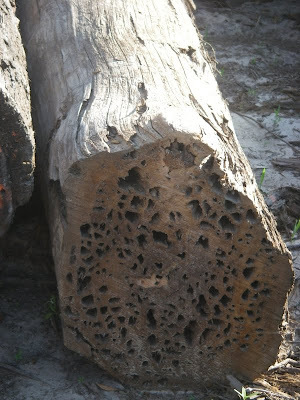 The fungus attacks the core of the trees leaving "pecky" vertical cavities over time. Interestingly, you can't tell that a particular tree has the pecky cavities until it has been cut down. The cavities are not visible from the exterior of the tree. Pecky cypress has become an endangered species unfortunately. The demand for it far outstrips the supply of it. 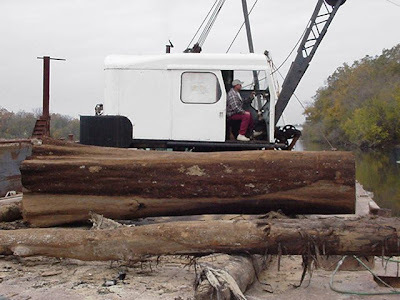 What's left today mostly comes from harvesting fallen logs at the bottom of rivers and swamp areas as well as from reclaiming boards from a previous use. Pecky cypress gives a room great texture. It's organic and rustic, yet it has an air of glamor to it when done in a modern context. The following pictures showcase just that. 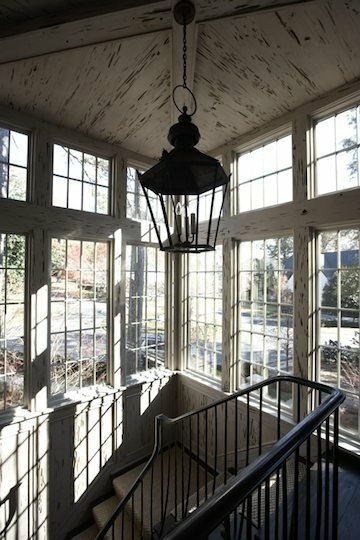 This enclosed side porch is perfect in so many ways, one of which being the limed (or is it milk paint) pecky cypress ceiling. Design by Betty Burgess, architecture by Chip Murrah. This Rosemary Beach home designed by Bobby McAlpine puts a creative spin on the coffered ceiling with the use of pecky cypress. It complements the white walls perfectly, providing just the right amount of texture and warmth to the room. 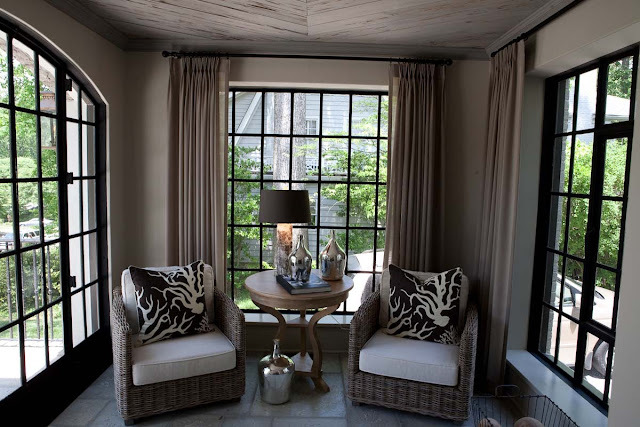 This study, from one of my favorite homes in Atlanta, highlights an alternative to dark stained walls via the airy look of limed pecky cypress. Designed by Melanie Turner and built by Benecki Fine Homes. Wow! The color and sheer volume of the pecky cypress used for the walls and ceilings in a home designed by Tracery Interiors are simply amazing. I learned something today James, and it is just 8:30 in the morning. Thank you. Pecky Cypress is gorgeous, and so are your photos. I would feel 100% happy in many of the rooms in your photos. I was not familiar with this type of cypress... it is gorgeous! I love the textured ceiling juxtaposed with the smooth walls. Hurray for Stereum taxodi. What I like is that it comes whitewashed right out of the tree. You'd hope the tree farmers are going for it but I guess they grow best in untouchable wetlands. Wow - great post - I had no idea about what pecky cyprus was all about. 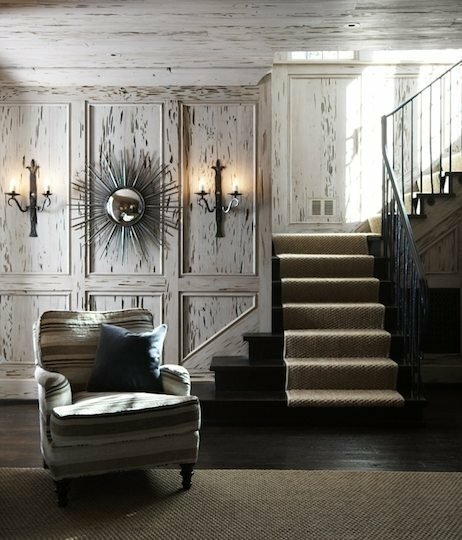 I have seen it more and more in houses designed over the past few years - I think it goes well with the rustic/Belgian aesthetic that is in vogue now. The pictures you used to illustrate your post are beautiful. that next-to-last photo/room is stunning. I just had a conversation with a decorator who used pecky in a house we visited at the S.C. coast. Loved it. Thanks for the info on how it is formed. I have thoroughly enjoyed my time here. I am renovating an old house in Coconut Grove Florida and we just put in the cypress ceiling on the covered porch. Addison Mizner, the architect who introduced the Spanish-Mediterranean look to Palm Beach used pecky Cypress in many of the houses he designed.